Heartfelt thanks to all of you who were so supportive and kind during Dad's recent hospitalization and surgery. I am happy to say that he is recovering well at home. Thank you for your prayers. 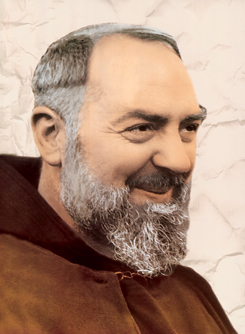 Dad is especially grateful to Saint Padre Pio whom he invoked before his surgery. Dad is recovering from his surgery slowly but surely. Remarkable for an 81 year old man! Yesterday, with help, he took a few steps around his unit. Although fatigued and needing sleep, he remains quick-witted and happy to see his visitors. I thank all of you who are praying for him and for my Mom. The two really are "one flesh" after 60 years of marriage. My family and I are grateful to all who have offered prayers for my father. He is doing very well. Today we were able to spend time with him. He spoke a little, even if he is experiencing pain and, more than anything else, wants to sleep. I anointed Dad last night. He had triple bypass surgery this morning. Being heavily sedated, he is not yet conscious (Thursday evening), but the surgery went very well. Deo gratias! And heartfelt thanks to all of you who are supporting us with your prayers. My Dad was taken to hospital by ambulance this afternoon. He will have bypass surgery on his heart tomorrow morning. Please keep him and my Mom in your prayer.